Controlling Resolume with the mouse is great. You can access every parameter and set it with precision. But during a live performance, you'll want to have more control than what the mouse can offer. Sometimes, you want an exact thing to happen at an exact moment, without having to scroll and search for it with the mouse. That's where shortcuts come in. You use shortcuts to assign a button on your computer keyboard or MIDI controller to a control in Resolume. Sort of like how CTRL-C and CTRL-V are shortcuts for copy-pasting. Except this time, you get to decide what the shortcuts are. 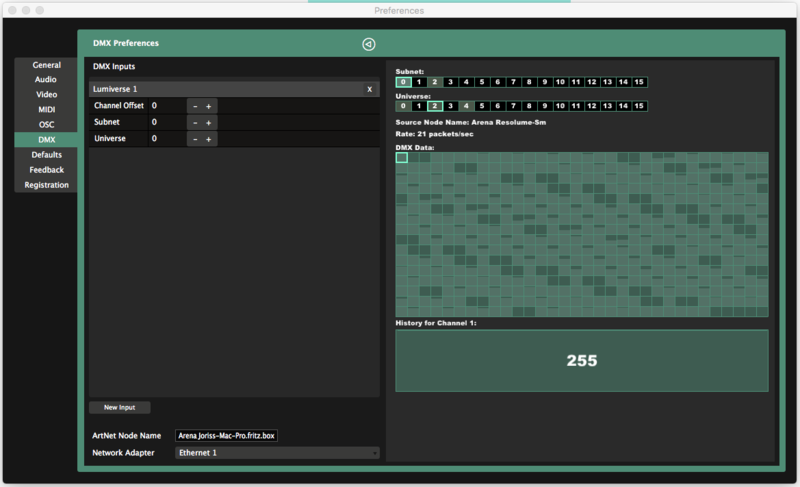 Resolume supports external control via your computer keyboard, MIDI controllers and OSC messages. If you're running Arena, you can also use DMX input from a lighting desk. In this chapter, we'll show you how to control Resolume from a lighting desk. You can assign DMX shortcuts exactly the same way as you do for your keyboard or a MIDI controller. The only difference is you'll use Art-Net instead of MIDI, so you'll need to let Resolume know you're sending Art-Net to it first. You do this via the DMX tab of the Preferences. "But Resolume, my desk doesn't support Art-Net. Can't I just send regular DMX?" Well, I'm pretty sure your computer doesn't have a DMX port either, so if you're sending analog DMX, you're going to need to convert it to digital one way or another. Instead of mucking about with USB dongles that all work differently, find yourself a nice little DMX to Art-Net box, and you'll be golden. "You know you just said 'analog Digtal MultipleX', right?" Ehm. Yes. That's pretty silly. To be honest, I had no idea what the abbreviation stood for, and I mistakenly thought that if you send it along a cable which needs a terminator to avoid reflections, the source is also analog. In my defense, I'm a video guy and when you say "terminator", I only think of sending a robot back in time to prevent an uprising in the future, thereby causing a time paradox which results in that very same uprising and a series of increasingly disappointing sequels. The point I was trying to make was that if you're sending DMX with a 5 or 3 pin XLR cable, you can't plug that into your computer anyway. You'll always need a box using a protocol to convert it to something that your computer can understand. We think that Art-Net over ethernet is the more reliable and future proof option. There, happy now? Tip! If configuring Art-Net is completely new to you, there's some nitty gritty technical stuff about IPs, subnet masks and interface adapters below. If you're familiar with configuring Art-Net and all that stuff, just read on for the Resolume side of things. Create a new DMX input via the New Input button in the bottom. This will create your first Lumiverse. You can assign which Subnet/Universe Resolume should start listening for Art-Net. It will default to Subnet/Universe 0:0, which is the first available universe. If you know which Subnet/Universe your desk is sending on, you can set Resolume to that here. Otherwise, you can set up your desk to send Art-Net on the same Subnet/Universe. Tip! After creating a new input, Resolume will let all nodes on the network know that it has an input available. So if your desk supports Artpoll, it should pop right up. 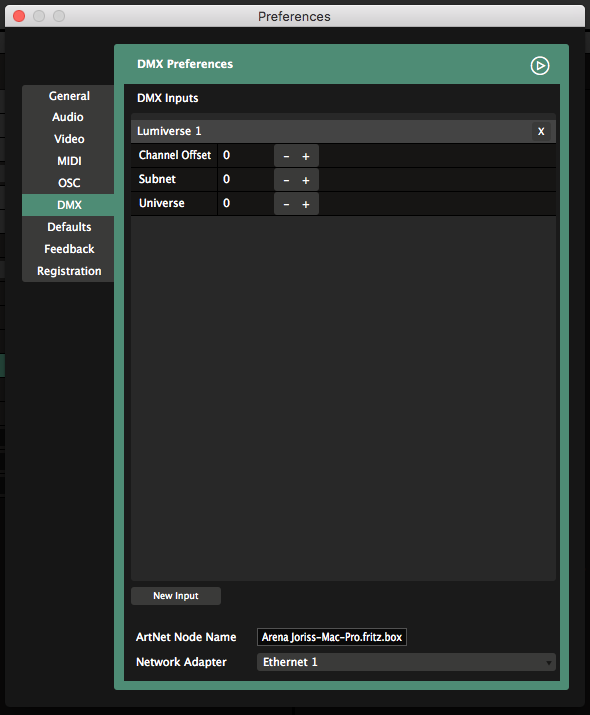 If you need more than 512 channels, you can create another Lumiverse via New Input. And another. And another. And another. And another. And another. Holy crap, what do you need so many controls for? "Lumiverse? Excuse me? Don't you know it's called Universe? Oh ma gaah, these video guys don't know anything!" Yes, you're right. Lumiverses exist only inside Resolume, hence the name Lumi-verse. You use them to create virtual inputs and configure your signal flow, before you actually connect to any Art-Net nodes. And when the node is disconnected, your shortcuts don't disappear with it. Also, should you want to switch Subnet/Universe settings during setup, you'll have to do that only once for each Lumiverse, instead of updating 512 different shortcuts. But yeah, video guys don't know anything. If you need to offset your first channel because you programmed other fixtures on the same universe, you can do that using the Channel Offset. Let's start with a simple shortcut. We want a flash blackout button. So when we press that button, the whole output should go black. This is useful as a sort of panic button ("oh no, get it off mah screen! "), or to create tension before a big drop. You create shortcuts by opening the Shortcuts menu, and choosing which protocol you want to create a shortcut for. The interface will now change color. For DMX shortcuts, we went with a nice pastelly yellow. Everything yellow can have a shortcut assigned to it. So find the Composition Bypass button in the top left of the interface and click on it with the mouse. Now you can either use DMX Learn and press the flash button on your desk that you want to use. Press the button and voila, you've assigned your first shortcut! If the Bypass button was big enough, you could even read which shortcut was assigned to it. Personally, I prefer assigning channels manually. Right click on the Bypass button and choose "Create DMX Shortcut". 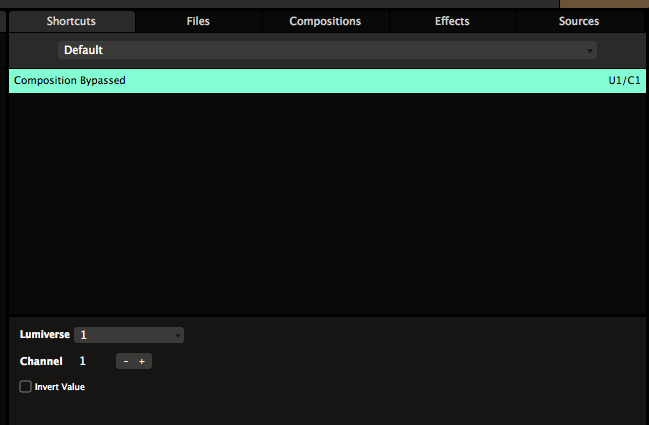 Resolume will automatically assign the next available channel to this button. Either way, now press the Escape key to exit the Shortcut mode, and you can now bash your shortcut to toggle the Composition Bypass on and off. On and off. On and off. On and off. Okay. Stop. That's enough. Let's dig a little deeper. Go back into Shortcut mode, and select the Composition Bypass again. In the bottom right of the interface, you'll see the Shortcuts tab. This tab is only visible while you're in Shortcuts mode. In this tab, you can see all your shortcuts in a handy list. You can also choose different options for your selected control. The only option you have for DMX is to invert the incoming value. Everything else can be configured on your desk. Of course, you can also change the channel manually. If you're using more than one Lumiverse, you can also change which Lumiverse this shortcut belongs in. This target just applies the shortcut to whatever order the clips or layers are in. This is the default mode for shortcuts on the layer and group panels. For instance, shortcuts for Layer Opacity default to By Position. Because you probably always want your first fader to control the first layer in your composition, regardless of how you re-order the layers afterwards. This target applies the shortcut to this specific clip, layer or group, regardless of where you move it. This way, you can assign a shortcut to always trigger a specific clip, like a color flash. It doesn't matter whether that clip is in layer 1, column 1 or layer 27, column 95. It will always be triggered by that specific shortcut. Beware! When you delete that specific clip, layer or group, of course the shortcut disappears with it! This target applies the shortcut to whatever clip, layer or group is currently selected. This will always be the clip, layer or group that is currently shown in its respective panel. This is the default target for any shortcuts you apply on the clip panel. "Come on, Resolume! Why you gotta make this so difficult? I just want to set things up and be done with it. Ain't nobody got time for this! Just tell me what to do already!" If you're unsure about what any of this means, just go with the 'By Position' target for all your shortcuts. It makes the most sense when working with a fixed controller layout. The 'Selected' target is very powerful to optimise controller real estate, but you need to be aware of what you're doing. The 'This' target is usually only necessary to control a very specific thing on one particular show only. Shortcuts Groups are shortcuts applied to a group of Radio Buttons, or to a Dropdown. Not sure what Radio Buttons and Dropdowns are exactly? They're explained in detail, with examples, on the Parameter page. Shortcuts assigned to these type of control are special. A regular control usually has only two options, On or Off. Shortcut Groups have a lot more. The Clip Direction controls have four options, Forward, Backward, Pause and Random. The Autopilot has four also. The Layer Blend Modes have so many options I lost count. When assigning a DMX channel to a Shortcut Group, Resolume will distribute the values over the group. So if the group has four options, like Clip Direction, value 1-63 will set the clip to play backward, 64-128 will be forward, 128-191 will be pause and 191-255 will be random. You can find a special Shortcut Group in front of the clip triggers. It's revealed when you enter DMX shortcut mode. When you assign a shortcut to it, you can trigger all the clips in that layer with a single control. Assigning a DMX channel will let you trigger clip 1 through 255 by sending different values on that same channel. Tip! This works on columns too. You can save presets for every shortcut mode. This allows you to save and recall different layout and shortcut assignment for different occasions. For instance, if you're a gear head, you can have different presets for each controller you own. A normal person could have have different layouts for the same controller, so you can play different styles of shows with it. Or you could have a separate preset for that one AV show you do with your musician buddy. The sky is pretty much the limit. Every shortcut you assign is automatically saved into the current preset. You can switch presets via the dropdown in the Shortcuts panel. Here you can also manage your presets via the New.../Save as.../Remove and Rename... options at the bottom of the list. Presets are simply XML files stored on your computer. So you can exchange presets between computers, or share them with your VJ friends. Or share them with other Resolume users on our forum. Once selected, you will see a list of all assigned shortcuts for this preset. This list contains each and every shortcut you currently have assigned, so it's very useful to troubleshoot things. If you're a bit of a nerd, you can probably already see what a shortcut is controlling, just by looking at its name. By default, the list is organised per shortcut name. You can also sort it per value, which makes it really easy to spot double assigned shortcuts. These will be marked in red. You can delete a unwanted shortcut by hitting backspace or selecting Delete from the right-click menu. Bad shortcut. Bad. "Resolume! What happened to the Auto-Map? I can't find it anywhere!" We took it out. Half of the stuff that was in the Auto-Map was pretty much useless. Who needs control over Anchor Y? At 8 bit resolution? Because a Resolume composition is highly configurable, you can't really rely solely on the Auto-Map. You already missed out on good stuff like effects and BPM synced playback. And now you will miss out on even more good stuff like groups and envelopes. "So you're telling me I have to make my own personality now? That's crazy! That's going to be super time consuming." It's really not. If you were using the old Auto-Map, chances you were only using it to trigger clips, control their intensity and maybe change playback direction or the transition time. The other controls didn't make much sense anyway. Recreating that's going to take you all of 30 minutes, both in Resolume and on your desk. After saving that as your own preset, you're set for every show, forever. Better yet, you can now create your own show file with unique controls, making you a more unique operator in the process. Interestingly enough, for VJ's, it's common practice to set up your own personalised show file with your own controller layout. In fact, it's a bit frowned upon if you don't know how to lay out your own controller. If you're really stuck with this, there is a user created DMX preset that recreates the Arena 5 Auto-Map in this forum thread. Before you can use Art-Net in Resolume you first need to make sure your network is configured correctly in Windows or Mac OX. You need to make sure the device (or software) sending the DMX to Resolume is in the same IP range as the computer running Resolume. So which IP do you need? Of course this depends on your other devices. But 10.x.x.x and 2.x.x.x are IP ranges suggested by the Art-Net spec, and most lighting consoles will be fixed to an IP in this range. 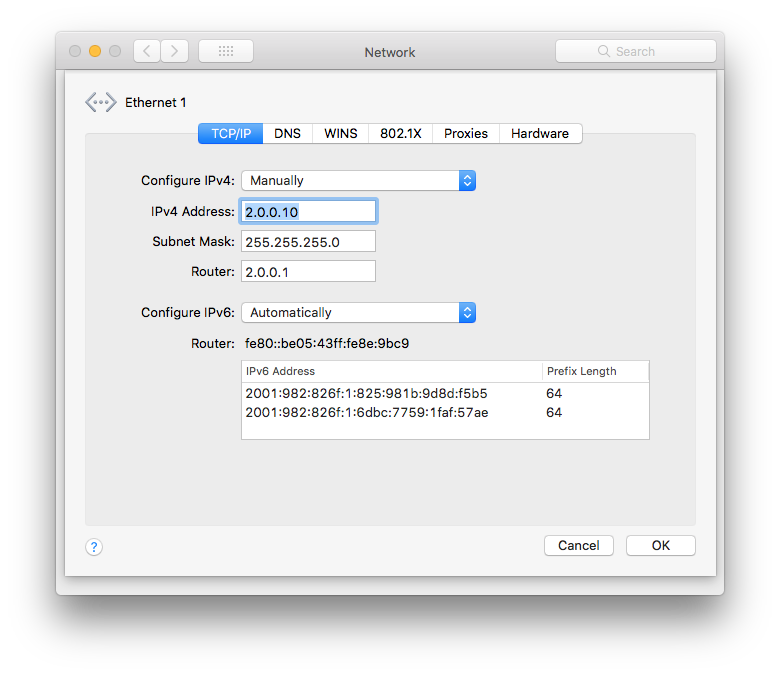 The Subnet Mask should also match and usually is set to 255.0.0.0 or 255.255.255.0. PC: Control Panel > Network and Internet > Network and Sharing Center > Change Adapter Settings. Double click the connection you want to use and scroll down to Internet Protocol Version 4 (TCP/IPv4) and set Use the Following IP Address. Art-Net gets sent over your network. Just like the internet. So to make sure Resolume uses the correct connection, instead of the WIFI (gasp! ), you can choose which adapter to use. You do this in the DMX Preferences. The Network Adapter dropdown shows you a list of available adapters. Keep in mind, this selection affects both DMX in- and output. This is also very useful when using two wired networks, one for Art-Net and one for other data, like NDI or OSC. Or another abbreviation. This works in most cases on Windows. It works in some cases on OSX. Because Art-Net uses the same port for sending and receiving, officially, this shouldn't work at all. We're putting it in as an option, so you can at least try. But yeah. Officially, it's very bad practice to let two applications on the same computer bind to the same port. In most cases, using the right "order of operations" will get you by. Start the sender first, then the receiver. Keep in mind that as far as your computer is concerned, this really is undefined behaviour, and your mileage may vary. In DMX, a universe is 512 channels of data. If you need to send more than 512 channels, you send those in a second universe. Art-Net can send a lot of universes over the same connection. Counting those is kind of interesting though. Every Art-Net universe is defined by a Subnet number, and a Universe number. By combining the Subnet number and Universe number together, you form the Art-Net universe. So yes, the same word 'Universe' is used twice with slightly different meanings. The 16 Subnets each have 16 Universes, which together form the 256 possible universes in Art-Net II. The first 16 universes can be found as Universe 0-15 on Subnet 0, the next 16 universes can be found as Universe 0-15 on Subnet 1, etc. So the first Universe is Sub:Uni 0:0, the second Universe is Sub:Uni 0:1. Etc etc. Confused? You should be. It gets even worse! Every developer uses a different method for counting and naming universes. For instance MadMapper doesn't use Subnets at all but counts Universes from 0 to 255, so starting from 0. When setting up Art-Net, GrandMa does use Subnets and counts each Universe in that Subnet from 0 to 15, also starting at 0. But internally, it doesn't and counts universes from 1 to 256. Wtf. In Resolume, although we think starting at 0 with counting is ridiculous, we decided to stick to the Art-Net spec and go with the Subnet/Universes designation, starting at 0. The node name helps you identify each Resolume instance in the Art-Net network. By default this is set to "Arena" followed by your computer's name. You may change it to Donkey or Monkey. Arena has a built-in Art-Net monitor. If you're familiar with the Artnetominator, you'll recognize its interface. You access the monitor by folding it open with the arrow in the top right of the DMX Preference. You will then see a list of 16 Subnets with 16 Universes each. This list will show you all activity on the currently selected adapter. Subnets with activity will show up in dark green. You can then select that Subnet to see the active Universes on that Subnet. These will also show up in dark green. In turn, you can select the Universe to see the data per channel. If you want to get right down to it, you can then see the history for each channel. 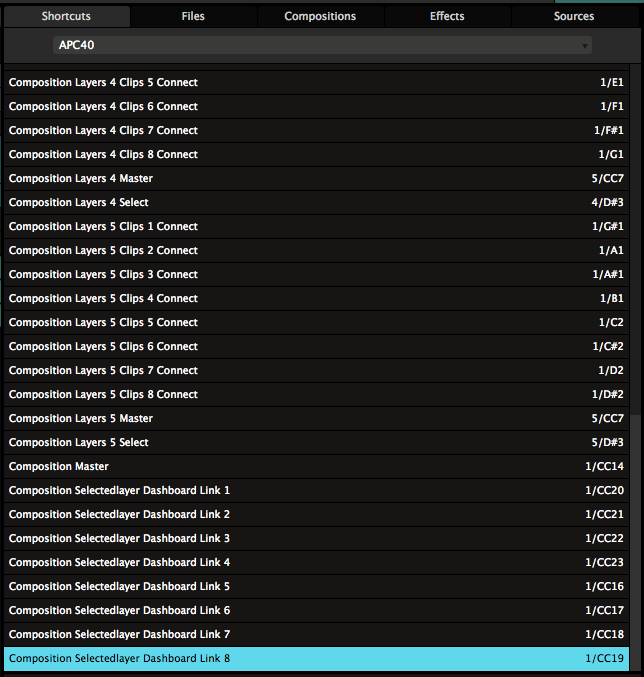 So in this example screenshot, we know that there is activity on Subnet 0 and 2. By clicking on Subnet 0, we see that there is data being sent on Universe 0, 2 and 4. By clicking on Subnet 2, we could see which Universes are being sent on that Subnet. If there is no activity at all anywhere, there is something going wrong with your network setup or the source of the Art-Net. If there is activity here, but Resolume is not responding, something is going wrong in Resolume. In that case, you'll want to make sure your Lumiverses are set to the correct Subnet and Universe, and that you've configured your shortcuts correctly. Art-Net is designed by and Copyright Artistic Licence Holdings Ltd. Bla bla bla.